Awesome photograph from one of the finest caterers on Long Island, NY, the Lombardi family. I have been affiliated with this family for about 20 years now. I photograph weddings regularly at all three of their catering venues: Lombardi’s on the Sound in Belle Terre/Port Jefferson, New York; Lombardi’s on the Bay in Patchogue, NY and the incredible venue you are looking at here, Villa Lombardi’s in Holbrook. The Lombardi family’s services can be summed up in their declaration to their clients that "...Reputation is Everything...". I feel the same way about my business which is why we have been such great business associates for so long. I have photographed literally hundreds of weddings at the Lombardi family venues and always look forward to working at Villa Lombardi’s. Not only is the venue absolutely beautiful but the food and service are amazing...top shelf!Though I have created thousands of photographs at Lombardi’s, the image you are looking at here is one of my recent favorites. I photographed this wonderful couple in the grand lobby under an archway that leads to a private area where couples can enjoy great photography conditions in a private spot away from all of their friends and family. After capturing this dramatic image I enhanced it using Photoshop to create the vintage look and feel of this picture. 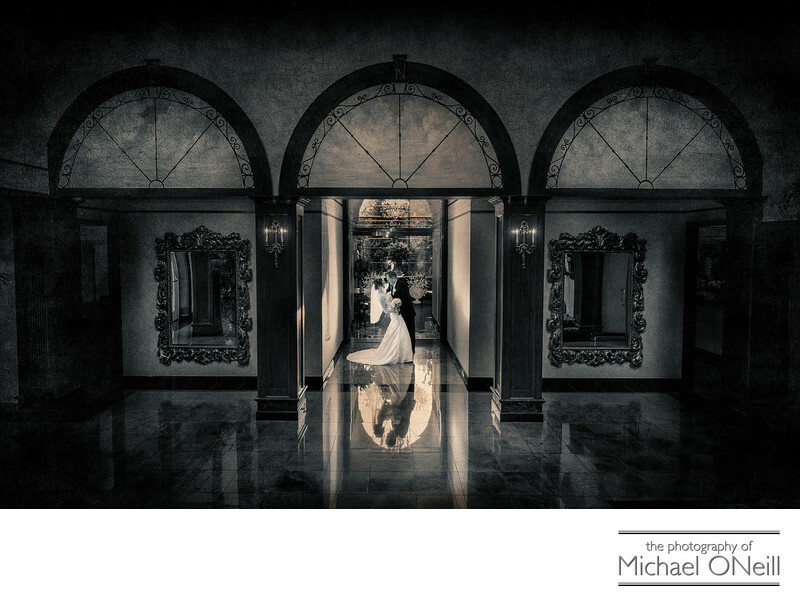 This image has won awards in professional wedding photography competitions on the local, Professional Photographers of Greater New York level; on the state level of the Professional Photographers Society of New York State, and, most recently, on the international level earning an Accolades of Excellence Award from Wedding and Portrait Photographers International (WPPI).If you are planning a wedding at any of the Lombardi’s locations be sure to make an appointment with me to view some of my favorite pictures and finished album designs that I have created over the years at their facilities. Reputation is everything and I enjoy my reputation through years of hard work, dedication and experience. Can’t wait to meet you and talk about your dreams and plans for the big day.